Discrete orthogonal polynomials. Asymptotics and applications(with T.Kriecherbauer, K.McLaughlin and P.Miller) Annals of Math Studies, 164. Princeton University Press, Princeton, NJ 2007. 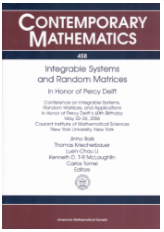 Integrable Systems, Random Matrix Theory, and Applications: In Honor of Percy Deift (with T. Kriecherbauer, L.-C. Li, K. McLaughlin and C. Tomei), Contemporary Mathematics, 458, AMS, Providence, RI, 2008. This is the proceedings of the Conference held in NYU, 2006 in honor of Deift's 60th birthday. Multi-point distribution of periodic TASEP (with Z. Liu) 10/09/2017 59 pp. PDF, to apear in J. Amer. Math. Soc. Fluctuations of the free energy of the spherical Sherrington-Kirkpatrick model with ferromagnetic interaction (with Ji Oon Lee) 07/05/2016, 07/14/2016 (revision) 32 pp.PDF Annales Henri Poincare 18(6), 1867-1917, 2017. Pfaffian Schur processes and last passage percolation in a half-quadrant (with G. Barraquand, I. Cowrin, T. Suidan) 06/01/2016, 07/06/2017 (revision) 57 pp. PDF Annals of Probability 46(6), 3015-3089, 2018. Fluctuations of TASEP on a ring in relaxation time scale (with Z. Liu) 05/24/2016, 02/06/2017 (revision) 51 pp. PDF accetped in Comm. Pure Appl. Math. Discrete Toeplitz/Hankel determinants and the width of non-intersecting processes (with Z. Liu) 12/18/2012, 5/16/2013 (revision) 30 pp. PDF Int. Math. Res. Not. Convergence of the two-point function of the stationary TASEP (with P. Ferrari and S. Peche) 8/31/2012, 18 pp. PDF Singular phenomena and scaling in mathematical models, 91–110, Springer, Cham, 2014. On a relationship between high rank cases and rank one cases of Hermitian random matrix models with external source (with D. Wang) 7/2/2012, 10/21/2012, 17 pp. 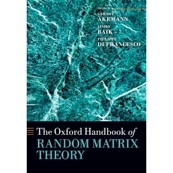 PDF Random matrix theory, interacting particle systems, and integrable systems, 25–38, MSRI Publ., 65, Cambridge Univ. Press, New York, 2014. Batch latency analysis and phase transitions for a tandem of queues with exponentially distributed service times (with R. R. Nadakuditi) 6/14/2012, 3/10/2014 (revision) 26 pp. PDF Queueing Systems 78(3), 255--285, 2014 . On the joint distribution of the maximum and its position of the Airy2 process minus a parabola (with K. Liechty and G. Schehr) 5/16/2012, 15 pp. PDF J. Math. Phys. 53(8):083303, 2012. Limit process of stationary TASEP near the characteristic line (with P. Ferrari and S. Peche) 07/01/2009, 59 pp. PDF Comm. Pure Appl. Math., 63(8): 1017--1070, 2010. On the Christoffel-Darboux kernel for random Hermitian matrices with external source 09/23/2008, 16 pp. PDF CMFT. 9(1):455--471, 2009. Asymptotics of Tracy-Widom distributions and the total integral of a Painleve II function (with R. Buckingham and J. DiFranco) 04/30/2007, 29 pp. PDF Comm. Math. Phys., 280(2):463--497, 2008. 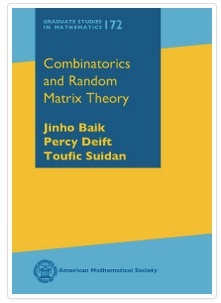 Random Matrix Central Limit Theorems for Non-Intersecting Random Walks (with T. Suidan) 04/09/2006, 21 pp. PDF. Annals of Probability, 35(5):1807--1834, 2007. A Model for the Bus System in Cuernevaca (Mexico) (with A. Borodin, P. Deift and T. Suidan) 10/17/2005, 9 pp. PDF. J. Phys. A, 39:8965--8975, 2006. A GUE Central Limit Theorem and Universality of Directed Last and First Passage Site Percolation (with T. M. Suidan) PDF. 12/14/04, 8 pp. Int. Math. Res. Not., no.6:325--338, 2005. Eigenvalues of Large Sample Covariance Matrices of Spiked Population Models (with J. W. Silverstein) PDF. 07/27/04, 24 pp. Journal of Multivariate Analysis, 97(6):1382--1408, 2006. Limiting distribution of last passage percolation models PDF. 07/21/03, 8 pp. a survey paper. XIVth International Congress on Mathematical Physics, 339--346, World Sci. Publ., Hackensack, NJ, 2005. Riemann-Hilbert problems for last passage percolation PDF. 07/01/01, 24 pp. Recent Developments in Integrable Systems and Riemann-Hilbert Problems, Contemporary Mathematics 326, 1--21, 2003, edited by K.McLaughlin and X.Zhou a survey paper about the use of RHP in the context of last passage percolation problems and related topics like longest increasing subsequence, random growth models and random vicious walks. Limiting distributions for a polynuclear growth model with external sources (with E.Rains) PDF. 03/22/00, 15pp. J. Stat. Phys., 100, issue 3/4:523-541, Aug. 2000. Random vicious walks and random matrices PDF. 12/29/99, 2/26/00 (revised), 24pp. Comm. Pure Appl. Math, 53, no.11:1385-1410, Nov. 2000.